A nonprofit group devoted to creating play areas has awarded $1 million to spur 50 new projects that create opportunities for urban children to play at places like bus stops, barber shops and Laundromats. Among the winners: a giant solar-powered bubble maker that on sunny days will send bubbles drifting over a busy Minneapolis thoroughfare. The winning projects were announced Tuesday by Kaboom, a Washington, D.C.-based nonprofit group that has built 2,700 playgrounds around the country since it was founded in 1996. Other winners include periscopes built out of PVC tubes at East Harlem bus stops and retractable jump ropes outside barber shops and salons in Richmond, Va. Sidewalks in Detroit will be repainted to resemble sprinting tracks and slides will pop up next to stairways used to commute through the slopes of Knoxville, Tenn. The winners were chosen from among more than 1,000 entries in the group’s Play Everywhere Challenge. The project is in partnership with the Robert Wood Johnson Foundation, Target, Playworld, the Department of Housing and Urban Development and the National Endowment for the Arts. Many of the winners focus on creating playful moments during everyday routines. 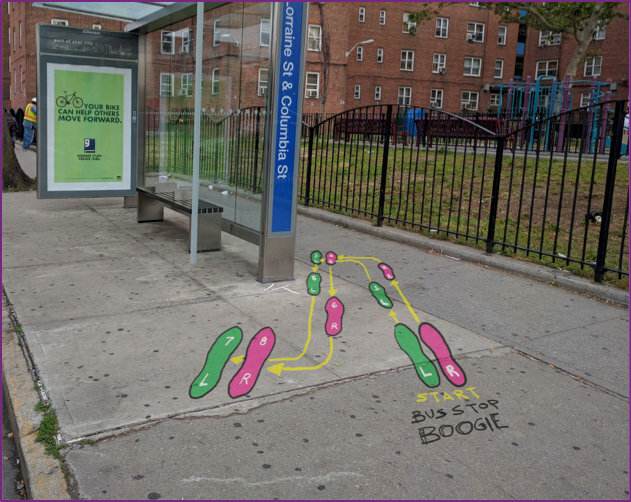 The New York City design studio Gigantic Mechanic plans to install footprints demonstrating dance steps on sidewalks near bus stops. In York, Pa., the nonprofit Eat Play Breathe York and the local YMCA teamed up to win funding to equip bus shelters with swings and paint adjacent sidewalks with designs encouraging kids to hop and balance. Some of the winning designs are in the slide show above; more are online here.